In their last blog post, Sophie and Mr. Lemani wrote about the challenges faced by primary school teachers in Malawi. To follow up, they felt that they should discuss various ways of mitigating some of these challenges. What follows are some ideas forwarded by Mr. Lemani. Some of them might sound familiar, either having been promoted in teacher training classrooms in our universities or in professional development sessions offered by our school boards. Others, though, demonstrate the divide that does exist between our two communities. Maybe after reading about some of the possibilities that could bring about a better school life for the teachers and students in Malawi, we can discover ways that we and our classrooms might be able to offer some assistance to lessen the challenges being faced and in doing so connect our communities together. 1. In order to minimize the problem of space in schools and erect additional classrooms, one solution could be to mobilize communities to mold bricks and lobby for assistance from the Constituency Development Fund (CDF) and other well wishers. Improve the accommodations for rural teachers and install solar electricity to attract teachers to teach in rural schools. Review the working conditions for teachers and increase rural teaching allowance to motivate rural teachers. 3. The use of TALULAR is required for a teacher to teach effectively. TALULAR is an acronym for Teaching And Learning Using Locally Available Resources. It is an intervention which is an eye opener for teachers to make use of locally available resources within their immediate environment. Its goal is to help teachers become more creative, intuitive and resourceful. If teachers made use of this intervention, teaching would become increasingly student-centered. The teacher needs to know the characteristics of the learners such as their age, physical characteristics, entry behaviour, ability, and size of class. The teacher needs to know the topic from the schemes of work (work plan for the term). The content to be covered should be worked out by reading through reference materials and textbooks prescribed for the subject. The teacher needs to decide what pedagogy to employ. The teacher needs to locate and make use of appropriate teaching and learning materials. 5. Older teachers need to stay current with changes that are made in the curriculum. Therefore, teachers should be oriented on the changes of issues included in the curriculum. This can be achieved through school based seminars where teachers can share their experiences. 6. To encourage children to go to school and to support their morale and material needs, there needs to be a liason between the school and parents or guardians through the Parents Teacher Association (PTA) and School Management Committee (SMC). 7. Girls who get pregnant at an early age should be encouraged to go back to school. A re-admission for these students is required so that they can continue their education. 8. Locals could help by raising funds to help alleviate some immediate needs (for example, purchasing balls, pens, pencils, etc. with the funds raised). These are the solutions that I would suggest. Since Mr. Lemani focused on things that citizens from Malawi can do to mitigate some of the challenges that teachers face, I decided to focus my attention on things that people like you and I, who live in Quebec, can do to help. However, before I go on to write about the solutions that I believe would be viable for teachers in Malawi, I would like to say that this blog is a very challenging one to write because I am not from Malawi. Therefore, I do not have a solid understanding of the solutions that would be plausible in this context. Too often, Non-Governmental Organizations (NGOs) and well-intentioned people from wealthier countries go into “third-world countries” with preconceived notions on how they can be of help. They go into these countries with big plans that are not necessarily tailored to the context and culture in which they find themselves. Nonetheless, they are determined to achieve what they set out to do and, in the process, they neglect to hear out the very people that they set out to help. As a result, even if they have accomplished what they wanted to do and feel good about the work that they have done, they do not end up doing any good because their solutions were not suitable for the context in which they found themselves. Of course, I am not saying that all NGOs and well-intentioned people are guilty of this. However, these colonial patterns of behaviour have occurred time and time again throughout our history and are still occurring to this day. One of the great things about the Malawi Project is that it is built on collaboration and reciprocity. The participants of the Malawi Project realize that they are not experts. They recognize the importance of working with the people of Malawi in order to find viable solutions. Imposing one’s own set of beliefs on others does nothing but harm. We have seen this happen too often. Thus, what can I say? Well, step one is to listen to the people that you are trying to help. We have done that. Mr. Lemani and I discussed the challenges that teachers face together and we reported them to you. Mr. Lemani has offered his opinions on how these challenges can be mitigated. Now, the question is: How can we help him, as human beings responding to the plights of another? After all, part of being human is helping another in times of need, is it not? One of the concerns we often have as participants of the Malawi Project is the harms that come from creating a culture of dependency. This thought is always at the back of our minds. Nonetheless, it is important not to undermine the power that comes from simply being human, having compassion, and truly caring about others. In my first blog post, I wrote about world structures such as globalization and free trade that benefit wealthier countries at the expense of poorer ones. In order to lift the poorer countries out of poverty forever, these systemic and structural problems must be addressed. While it may not be in my power to tackle the thorny issues of the colonial heritage of modern globalism, there may be concrete ways in which I can help. Why should we turn our backs on people and do nothing after hearing about and seeing the conditions in which they live just because no big change in our world will occur from this (i.e. entire countries will still remain in poverty while others become richer and more powerful)? What about the small changes? Are they not important too? What about helping another human being out of compassion and love and bringing about change in that person’s life? Is that not something too? Why not strive for the bigger changes yet not forget about the smaller ones? Are they not both important? Are they not both part of being human? Why not collaborate, listen to individuals and take action accordingly? After long reflection, I am ready to focus my attention on what we can do as human beings to help Mr. Lemani and the other teachers that face, on a daily basis, the many challenges discussed in the last blog. I apologize for getting sidetracked, but I felt I needed to reflect a bit before I delved into the topic up for discussion this week. What I will suggest will probably fall into the category of “band-aid solutions” rather than the category of “real solutions” because they probably would not bring about big changes in the world. Nevertheless, I believe that these “band-aid solutions” would at least bring about small changes that would benefit the lives of a number of teachers and students, which is also important and valuable. First off, Mr. Lemani discussed how mobilizing communities to mould bricks would be one solution to helping build additional classrooms in schools that do not have enough space. In order to do this, money might be needed. Therefore, how can we, in Quebec, help with this? Fundraising and then sending the money over would, in my opinion, be the way to go. However, sending the money over by mail would be risky and it is, of course, essential to consider who you are sending the money to. The best thing to do would be to fundraise the money and then give the money to the director of the Malawi Project, Dr. Christopher Stonebanks christopher.stonebanks@ubishops.ca, to ensure that the money gets to Malawi and to the appropriate individuals. The schools that the Malawi Project has been in contact with are the following: Chilanga Sighted Primary School, Chilanga School of the Blind, Chilanga Community Day Secondary School, and, most recently thanks to Mr. Lemani, Mponda Primary School. Thus, the money would go to the headmaster (principal) of one or all the schools (depending on how much money is raised). In terms of the living conditions of Malawian teachers, I would offer a similar solution. 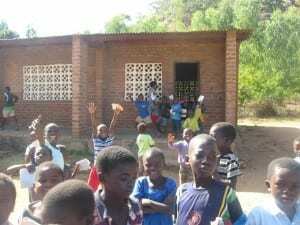 In fact, participants of the Malawi Project have been fundraising money to improve the accommodations for teachers at Chilanga Sighted Primary School for two years now and improvements to the houses are evident. More renovations are nonetheless required, but with the large sum of money that the school has received this year, hopefully only minor changes to the houses will be needed in future years. Moreover, I think that fundraising could also help solve issues such as the lack of desks, seats, portable boards, student uniforms, and washrooms for the schools mentioned above. Other than fundraising, sending materials such as exercise books, story books, maps, atlases, soccer balls, soccer pumps, and extra needles for the pumps could also be helpful, as many schools are in need of such materials. However, it is important to send materials of quality as opposed to materials that you would not consider using yourself. Too often when people send materials to “third-world countries”, these materials are, to put it bluntly, junk. When donating materials, one should always ask oneself: “Would I want this?” or “Would I want my child to have this?” If the answer is no, please do not donate it! One person’s garbage is not always treasure for another. To conclude, I realize that the aforementioned solutions do not offer any long-term changes. They are, as already stated, “band-aid solutions” that only offer immediate changes – changes that probably will not last a lifetime. As such, the same issues might arise again and might have to be dealt with again. However, I would like to believe that these solutions could at least help a number of teachers and students living in a certain time and place. Perhaps future generations will not benefit from these changes, but at least, people living in the present could benefit. Is that not something too?